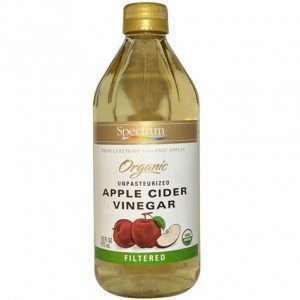 For hundreds of years apple cider vinegar has been used to support digestion. Recently, it has been credited with powers of detoxification, relieving joint pain and helping weight loss. In fact Hippocrates (the “father of medicine”) is said to have used it for its healing properties and to fight infections. This is as far back as 400BC. A long history then! Modern research shows that it has other astounding healing properties. Its acidity gives it anti-microbial properties. It can help with bloated tummies after eating (by reducing stomach pH)- so don’t use it if you have too little stomach acid! The big new discovery is that it can help to control blood sugar levels (called the anti-glycaemic effect). It has to be drunk regularly! It’s not the quick fix most expect these days! Drinking vinegar before a carbohydrate intense meal has been shown to reduce blood sugar glucose response by up to 30%. The dose is approximately 20g, the rough equivalent of 1 – 2 tablespoons of liquid. Further research has also shown it can help reduce fasting blood glucose levels as well. In a study by White et al in 2007 vinegar before sleeping was shown to moderate waking glucose levels in adults with Type 2 diabetes. The best variety is Mother Apple Cider Vinegar, organic of course! The proteins, bacteria and enzymes are similar to the bacteria and yeast in kombucha, known as the new kid on the block as a digestive aid and prebiotic! My advice is apple cider vinegar works. First, make sure you have the balance of acidity in the stomach. A Hair Mineral Analysis would reveal this by showing the sodium/potassium levels. Then get in touch with a naturopath or nutritionist to guide you through your highs and lows in blood sugar. (It goes without saying (but I’ll say it anyway!) that my word is not a substitute for medical advice and always consult your G.P. about your concerns).